For anyone blessed with a sunny garden with free-draining soil in the UK, it can be difficult to grow a wide range of garden shrubs as many of the plants which can cope with cold British winters also require a reasonably moisture-retentive soil. Frustrating though it can be for the plantaholics amongst us, it’s always best to plant according to soil and site conditions – unless you like a challenge! There are a number of flowering shrubs which I plant in sheltered, dry, sunny borders with poor soil – and which I know will thrive and flower well, which is the point after all! 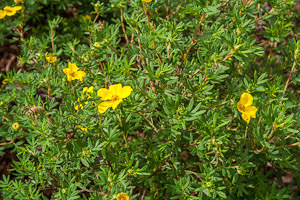 Shrubby Potentilla is a very reliable plant, and is both drought-tolerant and hardy. Naturally growing as a rounded or dome-shaped shrub (approx 1m-1.5m wide and high), it is also very useful to keep weeds at bay, as it grows into a medium size ground-cover plant. 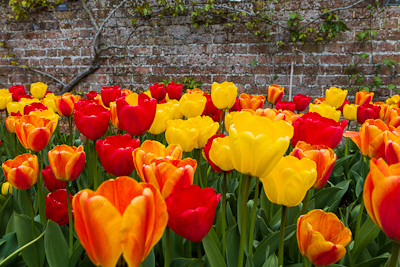 Flowers range from creamy white (‘Abbotswood’), to pale pink (‘Princess’) through to pale yellow (‘Primrose Beauty’) and brighter yellow (‘Elizabeth’ and ‘Goldfinger’) and on to the more orangey tones of Potentilla ‘Red Ace’ and ‘Sunset’. Everybody’s favourite (isn’t it?!) Lavender, isn’t particularly long-lived unless it’s treated with care and if possible trimmed back regularly before & after flowering (to stop it becoming leggy). 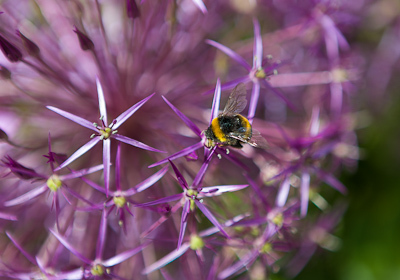 Still, it’s always a valuable addition to the garden (even if you have to grow it in pots) as there’s really nothing like it for fragrance and intense colour when planted en masse, not to mention the fact that it’s a great little shrub to attract bees into the garden. 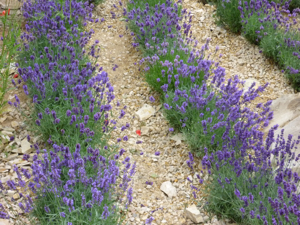 There are so many varieties of Lavender available, ranging in size and flowering period – and also hardiness, which is vitally important to know about in the UK. We are very lucky in Hampshire to have a number of local growers which we can visit to see lavender fields in full bloom. I regularly drive past the Lavender Fields at Selborne, and in midsummer it’s a real showstopper (www.thelavenderfields.co.uk). 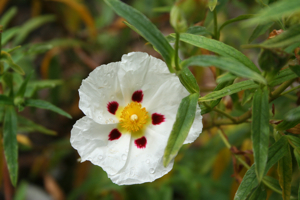 Cistus (commonly known as the rock rose) is a prolific flowerer in early summer – blooms are white or shades of pink. 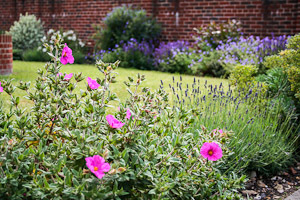 I particularly like Cistus ladanifer and Cistus purpureus ‘Alan Fradd’ which have white flowers with a maroon blotches. Very striking. Another favourite is Cistus x pulverulentus ‘Sunset’ which has beautiful cerise flowers. The blooms on Cistus only last a day, but there are so many of them that the shrubs are smothered in flowers for weeks. Hebes too are great in dry sunny spots. 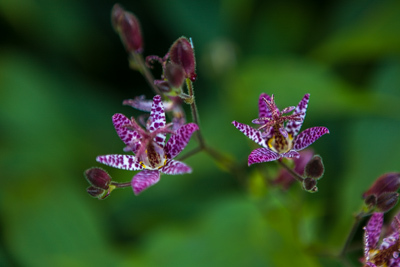 Hailing from New Zealand, Australia or South America, they range from carpeting ground cover plants, to very large shrubs, so it’s important to do your homework before buying! 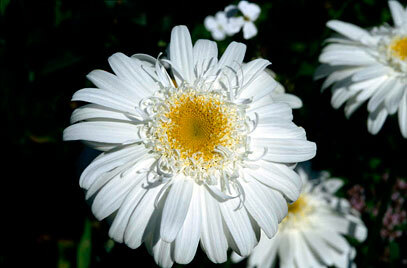 Most flower well given sufficient light, and come with white, blue or pink flowers. They do need attention with regard to pruning (or at least light trimming) to stop them getting too leggy and out of shape, but in the right position (and provided they are hardy enough) they are very useful as evergreen plants to provide structure in the garden in winter. For early flowering, Ceanothus (the California lilac) is fantastic. When it’s happy it will be smothered in clusters of small blue flowers. Tolerant of either acid or alkaline soils, it’s best if protected from cold dry winds, so shrubs are ideal trained against a sunny wall or fence where they form valuable evergreen coverage. 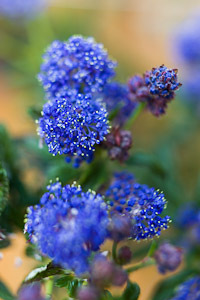 As free-standing shrubs, some Ceanothus varieties are quite low to the ground (in particular Ceanothus thyrsiflorus var repens) and therefore offer excellent ground-cover, whereas varieties such as Ceanothus arboreus grow into very large shrubs or small trees (up to 4 metres high). 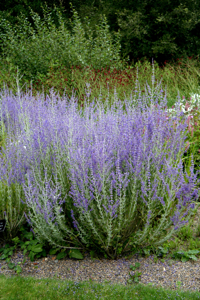 A great shrub for late flower is Perovskia (Russian Sage). 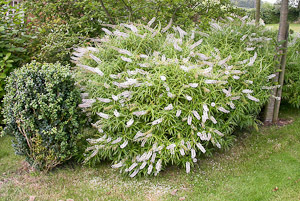 It’s a small shrub (or technically a sub-shrub) which after being cut back close to the ground in late spring, grows upright powdery white stems which flower in late summer and early autumn. Perovskia thrives in chalky and sandy soils, but really does need full sun and hates waterlogged soils. Not surprisingly most of the shrubs which can cope with dry sunny conditions and poor soil originate from the Mediterranean region or places with similar conditions, and as a result the aren’t ideally suited to the British climate. 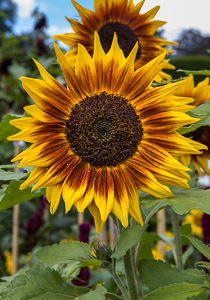 Generally they will grow fairly happily in average garden soil, but they will suffer in cold wet winters especially if the soil doesn’t drain well or they get hit by sudden frost, so chances are they will need replacing regularly. Personally, I think it’s worth it! Vary vary good….. I have a villa in Bulgaria, with a one acre plot….. What other plant`s would you reconmend for this very hot/Dry plot please…….. Tall plants preferd,,,,, I am thinking of putting some Red hot Poker`s in…… Will they be ok ?.. 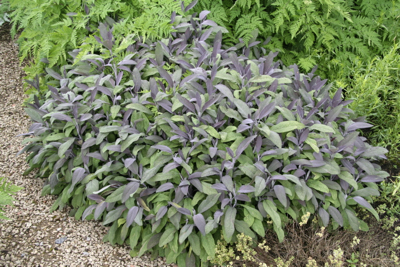 It will very much depend on your soil, so if it’s well-drained I’d go for plants like Verbascum, Phlomis Russeliana, Agastache or Verbena bonariensis, for example. Red Hot Pokers like quite a good (relatively moist) soil.